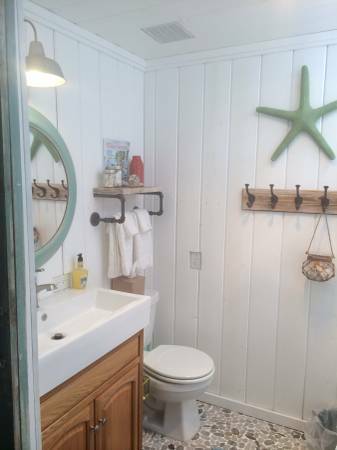 Mobile home bathroom remodels can be difficult. There are several different types of faucets, sinks, counters, toilets, and bathtubs. The choices are endless! Do you need a pedestal sink or a floating sink? Should you buy a center set faucet or a wall mounted? Do you need to special order your bathtub? 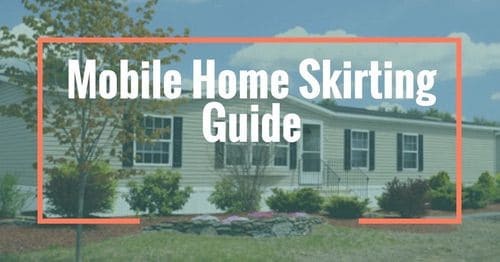 We’ve produced this mobile home bathroom guide to help you answer the most common questions and make the best buying decisions for your home and your family. A bathroom remodel isn’t cheap but they have a great return on investment. 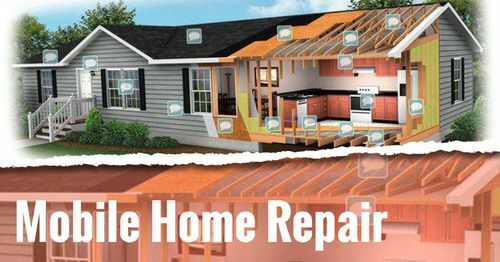 For every dollar you spend on the remodel you can expect to get around 70% back when you sell the home. In 2014, the average bathroom remodels (in a site-built home) cost $16,128 with a resale value of $11,688. That’s a good investment since you get to enjoy the new bathroom, too! There are a few different standard bathtubs for mobile homes: alcove, corner, oval, and whirlpool. In addition, there are several modern choices in unique shapes options. We’ll go over each one. 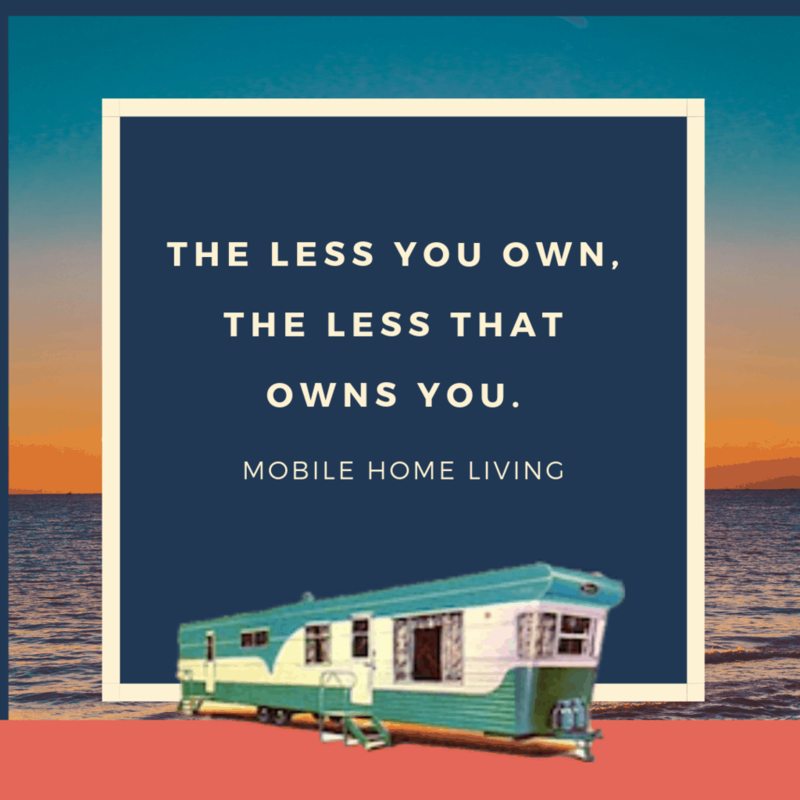 The National Kitchen and Bath Association states that the average bathtub size in the US is 60″ x 30/32″ but that’s not the case with mobile and manufactured homes. Mobile home bathrooms with alcove bathtubs are a bit different from your standard site-built home alcove tubs. The standard tub in your mobile home is probably around 6″ smaller, both width and lengthwise. You have 2 options to combat the size difference if you want a standard bathtub: buy a bathtub specifically made for mobile homes or buy builder-grade acrylic tubs from a regular bathroom supply company and retrofit their products to fit. If you choose to buy from a mobile home supply store you will pay a bit more but the process of removing and replacing the tub will be a lot easier. Mobile home bathtubs are usually 54″ x 27″ and a bathtub at your local home improvement store is 60″ x 32″. It’s hard to find an additional 6 inches in an already small bathroom so buying a mobile home sized tub is probably easiest. 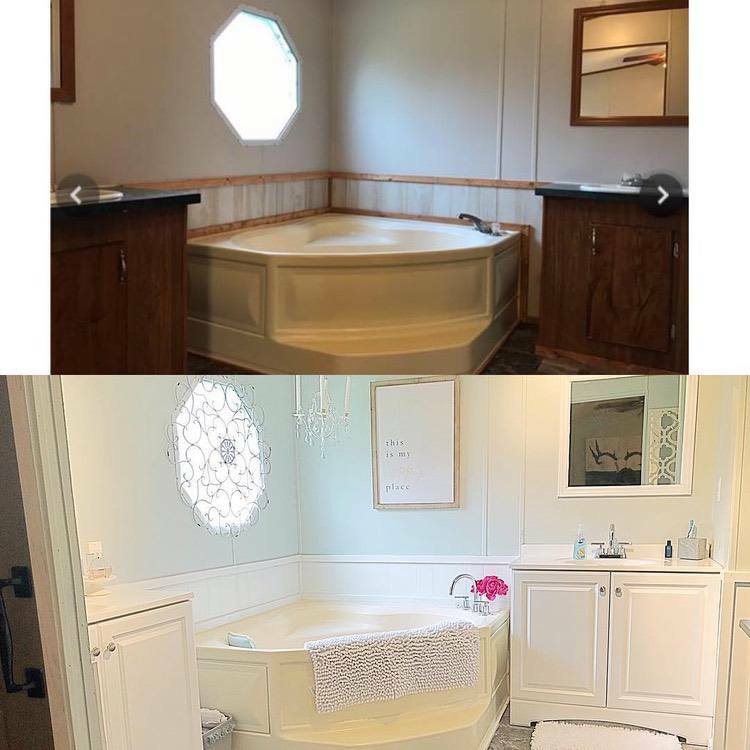 Before and after images of the $500 mobile home bathroom remodel. Corner tubs were very popular in mobile homes. They’ve been found in homes from the 1970’s to the 2010’s. Most of them are 54″ x 54″and run between $700-750 to replace. Site-built homes have corner tubs that are usually 60″ x 60″. That 6″ difference strikes again! Believe it or not, the standard mobile home bathroom with an oval tub is bigger than the average site-built home oval tub! Mobile Home Supply Store has two oval tubs, 64″ x 42″ and 64″ x 44″. 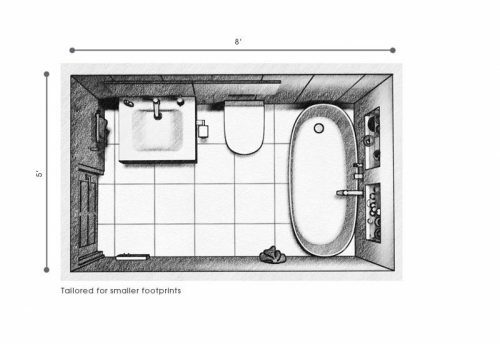 Per About, the average size for a oval tub in a site-built home is 60″ x 41″. Score one for factory-built homes! Palm Harbour’s Casa Grande Model has an oval tub. If you are completely gutting your bathroom you can choose whatever tub you want in whatever size or shape you want. That’s one of the best perks of a total gut remodel. If you have a bad back or neck or just enjoy water jets a whirlpool is a perfect choice for you. These tubs have powerful water jets in the sides and bottom of the tub. They are complicated to install and have high maintenance needs. You will need have the proper electricity wiring available wherever you plan to place the tub. 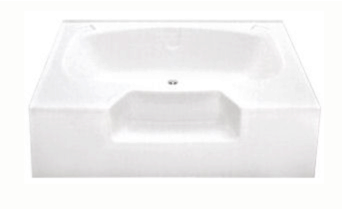 Luckily, whirlpool tubs are available in several sizes and shapes so you’ll find one that suits your space. One of the first bathtub designs was made with cast iron and had 4 awesome claw feet. The ‘feet were usually made to look like an eagle claw holding a ball. They have always been, and will likely always be a very popular bathtub design. A popular new tub shape is the cloud tub. They are freestanding and look great in both small and large bathrooms. Factory supplied mobile home tubs are prone to turning yellow after a few short years. You can learn why the tubs turn yellow and the best options to fix the tubs in our article, 3 Best Remedies for Yellowing Bathtubs in a Mobile Home. Bathtubs choices are complicated but faucet choices are maddening! 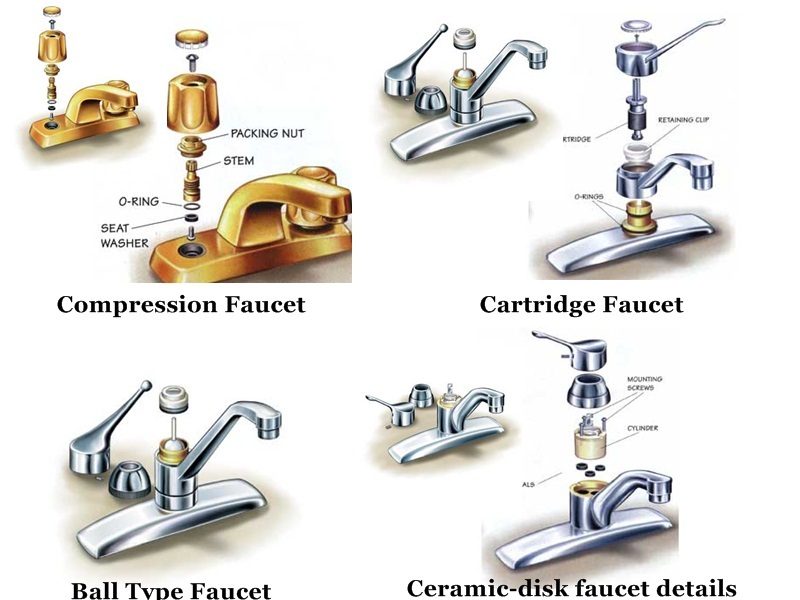 Faucets come in 5 varieties: center-set, mini-spread, single hole, wall-mount or widespread. Single Hole Faucets only require a single hole to be drilled on the counter. They usually come with one or two handles attached to the main spout. These can be tricky to operate for the very young or the elder as getting the right temperature is only controlled by one handle usually. You can buy them with temperature limiting valves to prevent scalding. 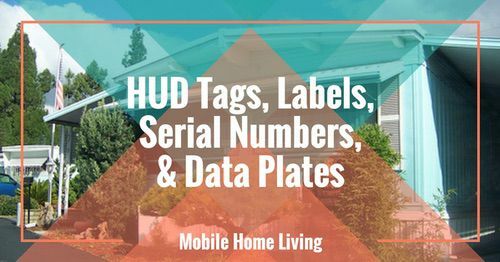 If you are transforming from a center set to a single hole faucet, deck plates are available and often come with the faucet. This allows the modification to remain stylish and covers up the additional holes that are no longer needed. Center Set Faucets are the most often used style in mobile homes. The holes are drilled 4″ apart from the center of the holes. The water temperature is controlled completely through the handles as there are 2 lines, one for hot and one for cold and they are mixed together in the spout. They come in either 2 handles or 1 lever designs that are attached to the base. Their compact size is beneficial for small spaces. 4″ Minispread Faucets are also classified as center-set yet are a bit different. They have 3 separate pieces which give the look of a widespread faucet but you can still use the standard 4″ openings of a center set faucet. Each handle controls either the hot or the cold water. It’s mixed together in the spout. Wall-Mounted Faucets are exactly what they say they are: wall mounted. These are becoming increasingly popular for small spaces because they don’t require additional counter room for the faucet. They are perfect for the modern vessel sink. Make sure to chose one that is the right length for the sink you want. It should extend to the exact middle of the sink upon installation. Widespread Faucets come in either 8″ or even 16″ wide styles. The valves and temperature mixing chamber are below the counter. They are usually very large and should be used in the correct environment, with a large sink. Otherwise, the scale will be off and it will overpower everything in the room. You can put any kind of faucet you want in your home, especially if you are changing out the counter and sink at the same time. If you are simply replacing a leaky faucet you should buy the style that fits the opening you have (most often it’s going to be 4″ center set in a mobile home). You can get a replacement faucet from a mobile home supply store for cheap or you can spend a bit more on a piece that really makes a statement in the room. If you are completely remodeling the bathroom, your options are wide open! Most recommend that you buy the faucet first, then the sink based on the type of faucet you’ve selected. You’ll also want to choose a counter. All new faucets should come with a template to help you place the holes in the correct spot. There are several types of sinks, too. Mobile home bathroom remodels are more complicated than most people think! There are 6 basic sink types: vanity top, console, vessel, pedestal, wall mounted, under-counter and countertop. A Vanity top sinks is a one-piece sink and counter combination. They are simply installed on top of a cabinet or as part of a complete furniture piece. They come in several different types of materials and sizes. Easy cleaning is one advantage but the size and weight can be disadvantaged. Console Sinks are similar to vanity top sinks but they are often supported by 2 front legs in the front and wall mounting in the back. They are great for small spaces but there’s little to no storage space under the sink. They come in various materials and sizes. They are easy to clean since it’s one piece with legs. Vessel Sinks are very popular these days. 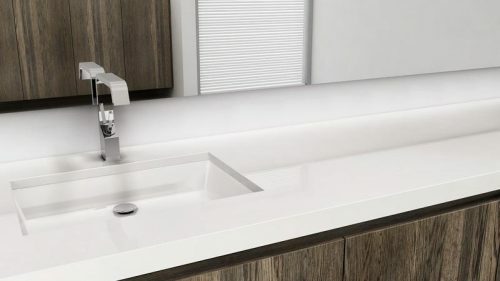 It’s basically a decorative bowl that sits either on top of the counter or inside the counter, though the top installation is far more popular. 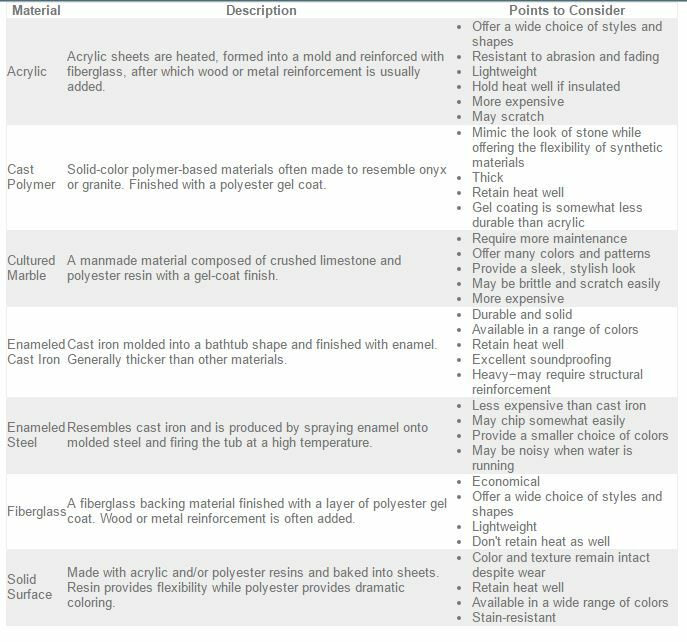 Numerous materials are available although glass seems to be the most popular. You must choose the correct faucet for vessel sinks. Pedestal Sinks are free standing sinks with a base. You often have to buy the 2 pieces separately but that gives you an opportunity to get the exact style you want. There’s no storage under these but they are beautiful and simple. Plumbing is often exposed. Wall Mounted Sinks are self-explanatory. They are attached to the wall and nothing else. They are often small in size and perfect for tight spaces. Under countersinks are set under the counter. This allows the inside of the counter to be seen around the opening of the sink so it should be decorative or one solid piece such as granite. They are installed under the counter with mounting kits. These are very popular as well and are often referred to as under mount sinks. They come in numerous materials, shapes, and sizes. Countertop sinks are the most popular style of any sink. The rim of the sink rests directly on top of the counter inside of a hole. The countertop material can be practically anything as long as it’s waterproof. Materials choices are numerous and they come in several sizes and shapes. Most mobile home bathroom sinks are set with clips placed under the sink opening. The parameter is sealed under the lip of the sink. Unscrew the clips and run a blade between the sink and counter and lift it out. Then replace them with whatever style you want! Try to get a replacement product that has a warranty and a good company reputation. 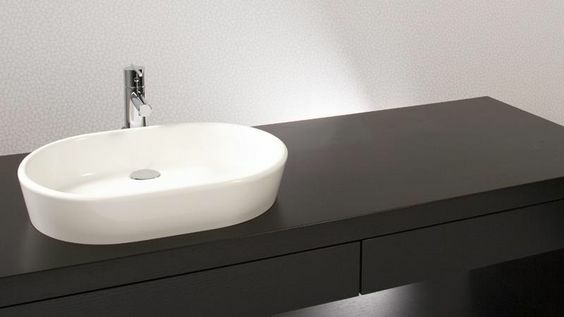 Kohler Bathroom sinks are known to be good quality with a lot of styles to chose. I can’t really say much about toilets in mobile homes. They seem to stand up very well. Of course, the guts needs replaced occasionally but that’s the case with any toilet. Mobile home toilets are easily replaceable with anyone on the market. You have 2 basic choices; a regular toilet or a handicapped one. The handicapped toilets are higher and may be helpful if someone has mobility issues in the home. All toilets you buy today are going to be low flow which is good, we don’t need to use 10 gallons every time we flush. Replacing toilets is not complicated: turn the water off, empty the water out of the tank and bowl. Unscrew and lift. Anytime you move or replace a toilet you must use a new wax ring. It’s just not smart to reuse them (yuck!). There’a little more to it but the magic is in making sure it’s level. If it’s not level, you are going to have complications. Leveling brings me to the last section, bathroom floors. Replacing the subflooring in a mobile home bathroom. I believe subflooring is the most important part of a mobile home bathroom remodels. Every drop of water that is allowed to reach the flooring (meaning the sub-floor and joists under the floor covering as well as the insulation) can get damaged. It can rot and cause weak spots and swelling. Chances are within 15 years of buying your home you will need to replace the bathroom floors completely if the appropriate precautions aren’t taken. In the ’80s, some manufacturers had the bright idea to put carpeting in the master bathrooms. What a mess! If you have carpet in your bathroom or floating floor without a waterproof membrane under it, get it out. The mold growing under it is not healthy and I will guarantee that it’s there, you may just not realize it. In the 34 years that I have proudly lived in a manufactured home, I’ve been involved with no less than 5 total bathroom floor replacements. It’s not easy. Using a waterproof membrane will help keep the bathroom dry and allow you some peace of mind that you won’t have to do it all again. Whether you have a lot of space or just a little, you need to utilize every inch. Here are some commonly used layouts in smaller bathrooms. If you are completely gutting your bathroom and love the modern look this is a great design. If you’re ready to do a complete bathroom renovation in your mobile home, begin from the bottom and work your way up. There’s no sense in buying all the fancy new fixtures if the flooring isn’t protected. Factoring in sub-flooring and giving the joists a good inspection before you install anything is the smartest move you can make. Alright, that should get you started on planning your bathroom remodel. Good luck! Hi Crystal, we are in the process of remodeling a 92 Fleetwood. In almost every aspect we have changed the original mobile home items to “real house” items. The size differences and lacking quality continue to amaze me at every turn. Our eventual plan is to move walls in the main bath to accommodate a full size bath, but not yet. Problem is now the tub faucet is dripping and I cannot find any info about putting a “real” tub/shower faucet/knob set into a mobile home. I’m trying to figure out if this is something a jack of all/master of none DIYer can tackle or does a professional need to come in. 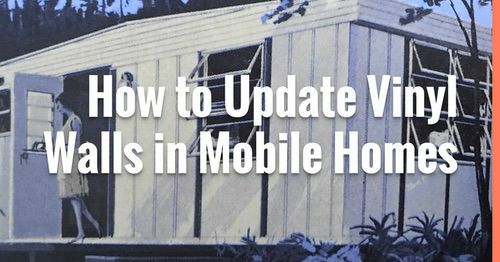 There is very little about this anywhere on the web, but most replace with the standard mobile home sets. Ideally, you should call a plumber because a leak in the wall behind a tub isn’t easy to detect and can cause a lot of damage in a short amount of time. However, sometimes you just don’t have the money and you just have to do what you have to do (and I know all about that!). The holes in the surround will be an obstacle, Mobile home tub faucets are usually on 4″ centers so you’ll need to find a new faucet that will either cover up the old holes with the faceplate, in addition, to installing the new valve to utilize the old holes as best as possible. You’ll also need to find the fittings that will transition your supply line to the new faucet, too. It’s not easy but it’s not the most difficult thing in the world either but the consequences can be bad if the least little thing is not done correctly. Ive have a tub with surround, yet it doesnt reach the ceiling. Can I put cement board over the paneling above the surround and adhere lamenent to it to create waterproofing? You can but anytime you layer things you risk creating an environment where mold and mildew will thrive, especially in a bathroom. If the surround is anything like my dads, it’s just made of VOG wallboard with (maybe) an added layer of the lamination or clear coat of some sort. It doesn’t hold up to water well and it won’t be strong enough to hold the new backer board so you’re going to have to be careful to get into the studs. If it was me, I would go ahead and remove the wallboard, add a little more insulation while I had the chance, and use a fiberglass surround that you can cut to size. We bought one for our 1978 single wide at Lowe’s for $129 that worked well. Are you still updating this site? It is great. I stumbled upon it googlng mobile home bathroom vanities. As we are redoing our dw mh. It is about 20 years old. Just had it painted now the vinyl planking is being installed. I have not been able to find anything about installing mh double sink vanities. Do the drawers get in the way of stick house vanities? Can I just buy a vanity at a big box store and will it fit? Thank you for such interesting articles. 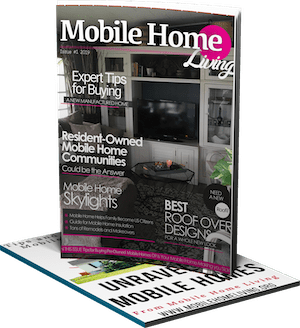 There should be a mobile home magazine. Hi Sallee! Thanks for the kind words! I’m on here every day (or close to it). You can buy a new vanity from a big box store but you’ll have to be careful with the dimensions. Since she is disabled, you should be able to get a doctor to write a recommendation for a true handicap shower. Her insurance would cover the product and the install (up to a certain percentage). In WV, the miner’s UMWA health care and Medicare help a lot of people get their homes retrofitted for easier living and I’m sure it’s probably the same in other states. 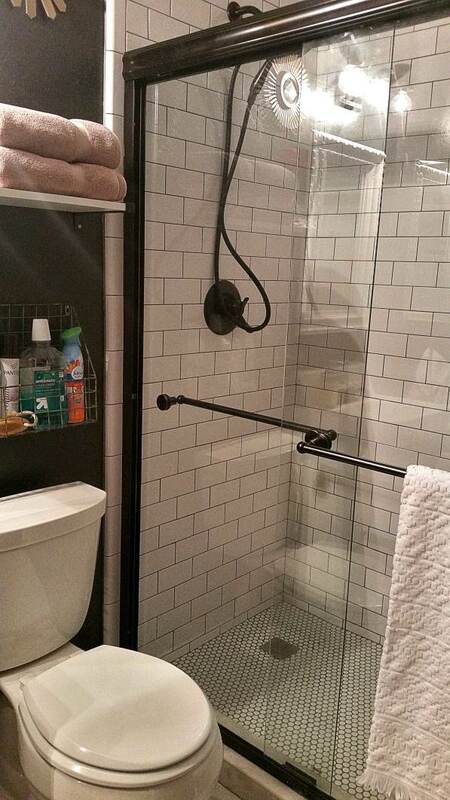 If that doesn’t work out, you may want to install a bench that goes out over the tub on one side and is screwed into the wall on the other side. You’d want to ensure the screwed side is waterproofed really well so water can’t get behind your tub surround. Make sure to screw it into studs and add a rail so she can hold onto it as she gets in and out. If you want to get real fancy you could design so that it can be removed or moved out of the way but still lock into place when she needs it. Best of luck! (let me know how it goes on the Dr. thing – prescribed retrofits for bathtubs are a big thing in SC, too, but I’m not sure about the insurance there). We are in the middle of a huge remodel of our 70’s single wide. The bathroom was a big project that is now almost complete. 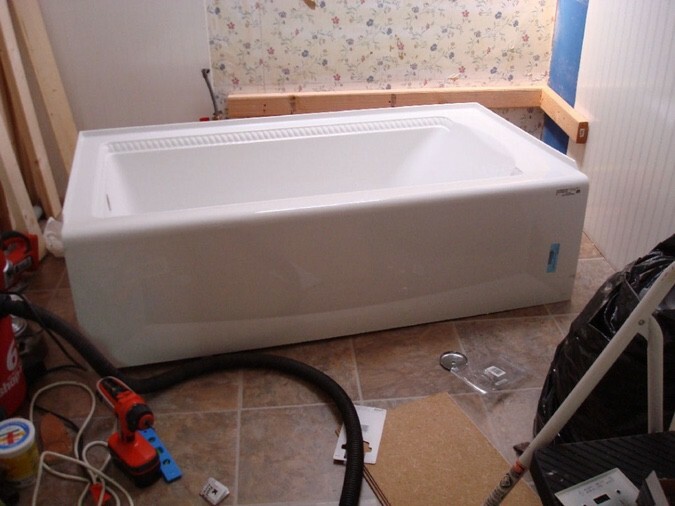 We removed the dangerous tub with a step and replaced it with a walk-in tub. The contractor beefed up the walls and we tiled from the top of the tub to the ceiling. We also replaced the floors with waterproof laminate flooring. 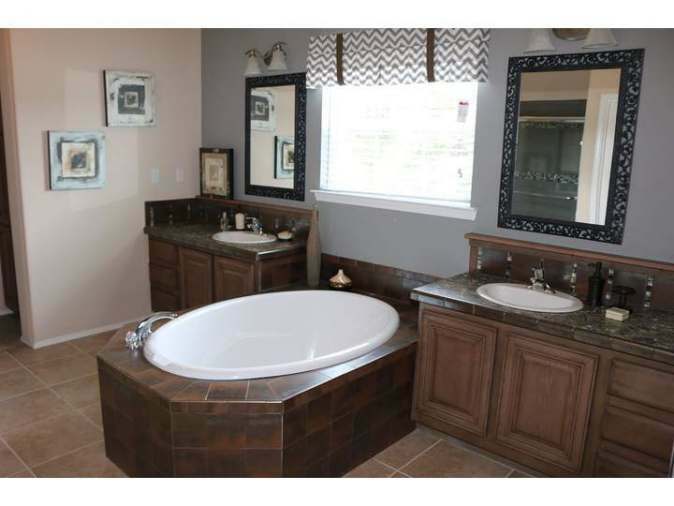 The fiberboard cabinets were replaced with a 36″ vanity with a set in sink vanity top. We added his/hers medicine cabinets. There were some wiring and plumbing improvements to support these changes so it hasn’t been an inexpensive remodel, but so worth it! We hired the remodel out because we had a large list of improvements, additions and upgrades in order to turn our 15,000 initial investment into our retirement dream home. I don’t know anyone out West but I did a google search and found a few results, click here to see them. You can always order online and have them delivered but I’m not a huge fan of ordering large things online due to damage potential and returns issues. Call around using the search results above and you should be able to find a local supplier. Best of luck! Can a large whirl pool tub be installed in a double wide ? The old one is 3ft.wide x 53FT. long . The whirl pool tub is 4 ft. wide and 6 ft. long and needs a plate form base. And the old tub has a left end drain and the new one would have a center drain. Could you please let me know if this new whirlpool tub will work . Thank you for your time. This new one also comes with the foists in-tacked. I wouldn’t be able to give you a definite answer without inspection. Weight will be your biggest issue so the location of the tub in relation to the chassis is important. Tub material and weight when it is full of water is also important. Then you will need to have the drain moved and possibly the faucet. You’ll definitely want to bring a plumber in so you don’t damage the home. Sorry! Best of luck! 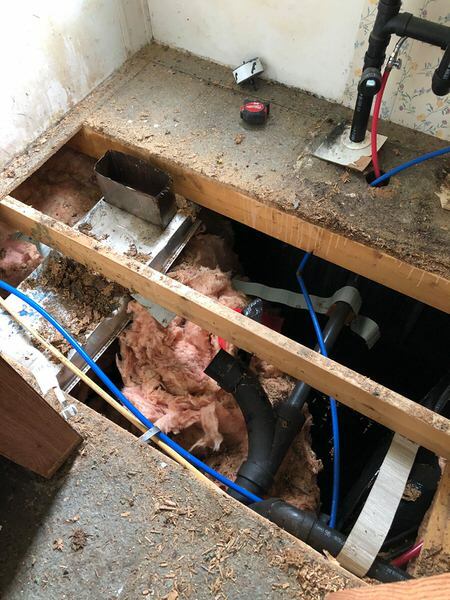 What is under the tub in a mobile home?I am replacing subflooring in the bathroom and hallway but really don’t want to pull out the shower tub unit. I am hoping the shower tub unit is on something stronger than the subflooring and waterproof or that it is sealed so it protects the tub support floor. Thank you. There’s usually nothing different under a tub from what you have beside the tub (flooring, subflooring, joists). You’ve covered every aspect of a bath remodel well except the on thing I need to know. What is the best choice for the top faucet replacements? All I’ve found nearby are cheap plastic models made in China. I’ve paid for two of the same caused to be pit in and both were defective. Are there any tub faucets made of actual metal available? Go to Lowe’s and buy a Moen. Those plastic faucets are terrible. You should be able to find a Moen that will fit your holes perfectly or very close. I’ll make a note to add that info! Thank you! This is great love all of the information. My husband and I are going to have to do a bathroom remodel because the tub in the master have multiple cracks in it. Is that a common thing in mobile homes? Also this will be my first mobile home remodel and I am not sure what to expect once we tear the tub out, specifically the flooring underneith. I have experience with stick built homes and so I am afraid if we pull the tub out we are just going to have insulation between the bathroom and crawl space and I just couldn’t sleep in the house knowing that is exposed. Really we are trying to plan ahead with what to expect and that is my biggest fear. I can handle the severity of the damage or even going over budget but not that. Yuk. Can you send us your thoughts on that please. Tiled showers installed in place of a tub is a very popular home improvement project. The difference between the successful jobs and the unsuccessful jobs is using the right materials. When done properly (and with the right materials) you can expect a beautiful, long-lasting, and healthy tiled bathroom. You cannot go cheap when tiling a shower and you cannot have someone do it that isn’t knowledgeable in plumbing code. New technologies in tiling (waterproofing ‘bladder’ systems, grouting ingredients, and even lighter-weight tiles) all combine together to create a much better tiling experience than we had just a decade ago. You can now buy complete floor pan systems that will help make the job a lot easier. 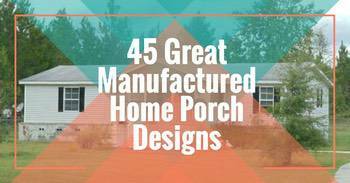 It’s a good project that will certainly add to your home in many ways! I’ve wanted to get an article together about the whole process but finding images has been difficult, maybe you could take some images for us? In considering a complete gut out bathroom remodel. Some of the information I was hoping to read in your article isn’t there. When moving fixtures to new locations within the bathroom inevitably plumbing becomes a major issue. This is my first mobile home (1987 New West) and I’m not familiar with the construction or the plumbing in one. The line servicing my toilet comes up through the floor (not the wall) as well as the tub and possibly the sink as well. The sewer drains also will need to be relocated. I’m guessing this will entail removing some skirting and going underneath the home to make the changes. I’m interested in learning about these types of issues. Also, I’d like to put in a cast iron bathtub, I’m concerned about the weight, if the floor is designed to handle it. I’m not sure what an average cast iron tub weighs but you’ll probably want to reinforce the flooring and, if at all possible, install it over the steel chassis. If you’re in a double wide you’ll want to be cautious of uneven settling, too. Best of luck! Let me know if you have any particular questions. Hello Crystal, I stumbled upon your website while looking for decorating ideas for my 1963 mobile home bathroom. My husbands sister gave us our home last year when she got married. It has been one project after another. After almost one year, I finally completed my landscaping project. I am so proud of how my yard looks now. My neighbors all love it. Even if your home is older, it can still look fabulous. Now I am working on the inside and wondered if you might have any tips. The color of the bathtub, sink basin, and toilet is hard to describe. My sister-in-law says it is peach, but it is too dark. I compared it to different paints and I think it is closer to a coral or maybe salmon. Sometimes it looks more brown than pink depending on the light. They were all painted white, but it was chipping off bad so I stripped the paint. Now nothing matches. The cabinet doors and front of vanity were painted sea foam green and the walls were a light peach. The floor tiles are white with tiny blue and brown flowers. The vanity top is white linoleum with grey marbling. I really do not want to refinish the fixtures again. I currently have a tropical sunset themed shower curtain which works perfect with the coral colored tub and toilet. I took pictures and used Sherwin Williams’ paint visualizer to compare color pallets, but I have no eye for decorating. I feel like the darker grayish blues looked best on the walls (Naval or indigo). On all of the doors, drawers, and ceiling I was going to try a color called Bungalow Beige. It is an eggshell color with a barely noticeable hint of blush. I have wood trim around the door and along the bottom of the walls. They are currently dark brown, but I was thinking of going with a dark color in the red family like Arresting Auburn. I have a brown wood mirrored medicine chest on the side wall above the sink. I thought I should paint it the same as the vanity doors. I tried lighter colors on the walls, but nothing worked with the sink and vanity top. I would appreciate any suggestions you might have. I realize it is hard without photos. Thank you! We’ve been trying to update our bathroom too – I swear I think it’s the hardest room to makeover on a budget. I’ve decided to just buy a new tub cause while there has been a lot of advances in the tub painting industry, I just don’t think it’s worth the time and cost to try yet. Maybe in a few more years they can figure it all out! Till then, I think painting the cabinetry and adding some kind of texture on the walls is probably the easiest way to update a bathroom. We spent $30 on several rolls of discontinued wallpaper at Lowe’s and wallpapered around our mirror in a wheat grass paper that was very textured. Then painted the built-in cabinetry a dark brown (I had it white but white cabinetry in the bathroom was just too hard to keep clean) and then painted the walls a dark teal. It works OK till we can completely rip it all out. Crystal, have you heard of anyone boxing in or otherwise remodeling one of those darn garden tubs? I’ve got one in the master bath in our new-to-us 2007 double wide, and I’m planning on remodeling the room in an Old Mexico style. So tile will be a major decorative element; I want to sort of recreate the feeling of a fountain in the zocalo with the tub, so I’m thinking building a box around the present (stepped) sides and ??? over the rim. Having no luck at googling this kind of alteration to a garden tub- maybe you’re run across something? I always feel like if there’s a will, there’s a way, especially when it comes to remodeling..lol..I’m pretty sure I understand exactly what you’re wanting to do, and if I’m close, it would look awesome!! Your only worry would be the waterproofing aspect of it all but all the new tiling products that are out on the market these days it would make the job a lot easier than it would’ve been, say, 10 years ago. To box in the tub you would simply need to line the area (under the tub if possible) with a liner or pan and frame out the structure with waterproof tile board. Once you have it all tiled and the grout is dry you would want to be extra careful with the sealing between the tub and the tile and coat it all with a waterproof membrane type product. The liner or pan may be a little bit of an overkill but it would keep the floor safe and that’s a big priority whenever dealing with a tub or shower install. If you don’t mind, click this link and scroll down to the bathtub with the tile being installed around it. You’ll see how that was done and it would work for covering the steps on the other side. It’s a job my husband did inside a double side. We advised against the fireplace but the owners wanted it so it was done. Still, I wish they would’ve let us set in the wall along with some added protection to ensure it could never end up in the tub, especially when water is in it! Tell you what I think is the ultimate bathroom design – when you have a glass sink with live fish in the basin part of the sink. I’ve seen this a couple of times and it’s such a clever idea! Yes I completely agree that bathrooms are the most changeable rooms in a home. Well, this is really a valuable guide to mobile bathroom that will definitely help people to make their bathroom remodelling process a successful one. Choose a plumbing company that is the best in the business at your locality, because you cannot hand over the responsibility of plumbing installation and, maintenance to each and everyone, without being sure about their performance level. Luckily, I have found plumbers Pretoria with the most satisfying services I have ever received in the last couple of, since I built up my home in this city. Hi Shirlee! I'm so glad to hear from you again!! I did move the site to WordPress and it's caused all kinds of problems! I promise it's nothing to do with your computer, it's all on my end unfortunately. I've hired a webmaster to fix all the issues though so hopefully in the next week it will all be better. Right now, the list is pretty long: browser compatibility issues (not appearing on computers), the RSS feed needs fixed and all the past comments (all 1248) are not showing on the site, although I can see them all in the admin. I thought I could handle the transition but it was way over my head! Lesson learned, hire professionals from the get go on things you know absolutely nothing about…lol. Don't give up on me yet! I hope all is well with you and your enjoying the spring. Take care! Hi again Crystal. Did you move your site to wordpress? It doesn't always show up on my blogger list plus a few times I could not get your site to load. But I think it's a problem on my end, computers have a way of not co-operating every once and a while. I don't know who came up with the carpet in the bathroom idea but what a bad one that was! Double ick factor there. Interesting to know about the difference in bathtub size. We never had to do a bathroom reno when we owned a mobile home. We lived with the harvest gold fixtures since it was short term, but I do remember flooring issues. Hope all is well with you! Have a great weekend.